Jagtvej 69 becomes a turning point for homeless people. Where housing and green gardens are creating a platform for the meeting between locals and homeless and a pathway to a new beginning. The aim of the design for the new building on Jagtvej 69 is to create temporary accommodation for homeless people, as well as provide a space for a wide range of activities that would help them in their professional and social lives, improve communication with the authorities and help them take care of their physical and mental health. The proposal will provide the neighborhood with a new social meeting place, a space containing urban gardens and semi-public activities. 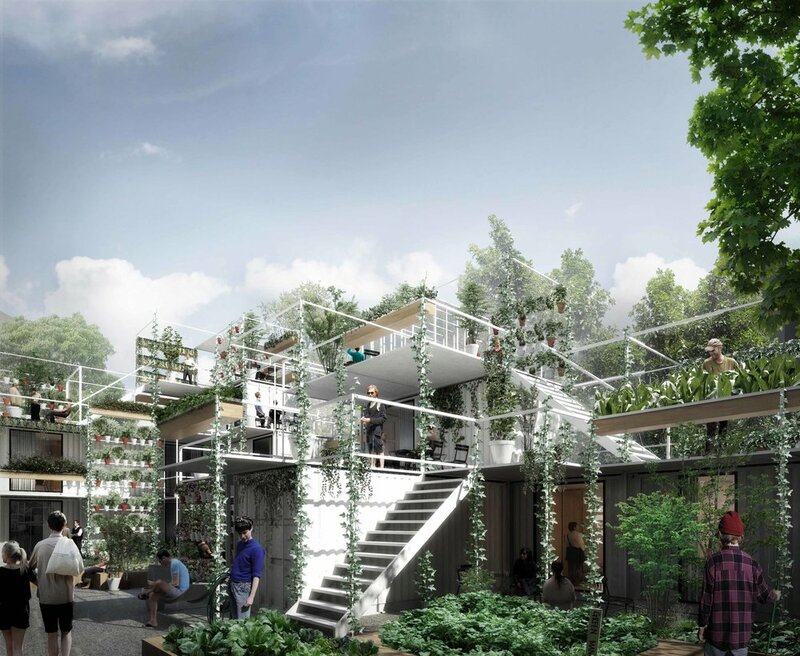 The project gives back the site to Copenhagen, and create a platform where people can meet and interact around the green gardens. The project will have a positive visual contribution to the neighborhood – a landmark people can relate to with social and environmental sustainable initiatives. The visibility aims to raise awareness of the initiative, in terms of attracting new users to the neighborhood, but also volunteers and current residents. The concept for a temporary design is based on a very simple scaffolding net and containers with the ability to add new features and change according to new needs the future may bring. The project will be dismantled and placed on a new site that needs help in future.